Weybridge is home the 435 acre US Morgan Horse Breeding farm, given by Joseph Battell. Famous people from Weybridge include; state senator Claire D. Ayer; physician & politician Darius Clark; US Senator Silas Wright; and US Congressman Sidney Lawrence. 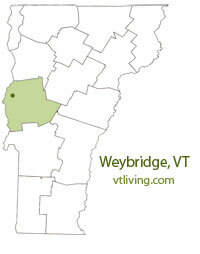 To share Weybridge, VT information, contact us. Learn more about advertising in VTLiving.